You knew that you would have acne breakouts as a young adult, but you didn’t know you would still be dealing with them today. For some of us unlucky souls, our bodies never quite get the memo that it’s been a decade or two, and we still get the occasional pizza face. It can be extremely embarrassing to be the only one out of your group of friends that are still struggling with teenage-like acne. When I tell you that I’d tried it all, before stumbling across Tea Tree oil acne treatment, I literally mean that I’d tried everything — and then some! Accutane, prescription topical medications, antibiotics, cutting out white sugar from my life entirely (RIP home-baked chocolate chip cookies with my afternoon tea)… I had actually reached a loss as to what to do. There are a number of components that factor into why our skin refuses to behave. Genetics, hormones, environment, diet, etc. are all factors. But what remains is a desire to be able to leave the house without a face full of concealer. I diligently washed my face with the gentlest, chemical-free cleanser morning and night. I made sure not to touch my face during the day, and even changed my pillowcase religiously. This was so as not to have natural oils from my hair and scalp touch my precious, delicate facial skin. I can’t even begin to tell you how many hours I’ve spent waiting at the office of different dermatologists. I’ve spent an endless amount of time consulting about different products and brands. Only after you’ve seemingly exhausted every possibility, a solution finally presents itself to you in a form you’d never even have thought to consider. Don’t be afraid of putting oil on your skin. 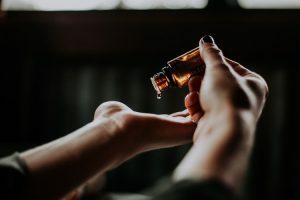 The uses of Tea Tree oil are hot topics in beauty and skincare these days, but many people are uninformed about its history as well as what it can actually do for you. 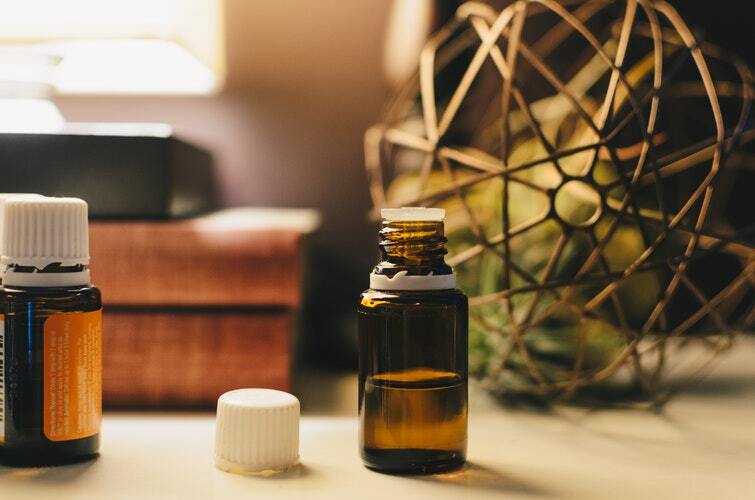 Aboriginal Australians have been using Tea Tree oil for generations, and researchers in that same country have supported the fact that this essential oil can work just as well as treating acne as the top drugstore remedy, benzoyl peroxide. Plus, using a natural substance such as Tea Tree (instead of the harsh chemicals found in many prescription and over-the-counter topical creams) means that the acne-healing properties won’t come with the high price of drying out and damaging your skin. 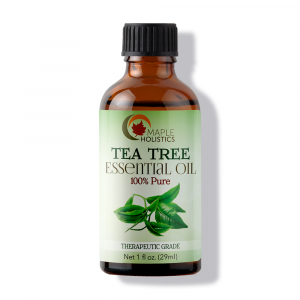 Many folks even use Tea Tree Oil for Oil Pulling! I was picking up supplies for my best friend’s bridal shower and needed to grab a few essentials for myself. 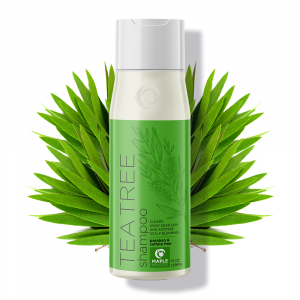 A bottle of Tea Tree shampoo caught my eye and I thought it might be a good investment for my oily scalp and hair (yup, that’s right – my oily problem doesn’t end with my skin. I really won the lottery on that front!). Well, that shampoo was a hit, so I started researching more about “Tea Tree oil,” which I knew very little about. I figured, if it could work such miracles for the oily hair I’ve been battling for years, what other wonders does this little essential oil hold? And wouldn’t you know it, but using Tea Tree oil for acne has been scientifically as well as anecdotally demonstrated to work. Tea Tree oil works wonderfully in small doses, but be careful not to overdo it. If you use it too much it will dry out your skin, creating a vicious cycle. The skin over-produces its own oils to make up for this dryness. Tea Tree oil also makes the skin more sensitive to UV rays, so stay out of the sun – and if you must be exposed, be extra careful about sunscreen and wearing a hat. If used in the correct dosage, Tea Tree oil won’t remove the skin’s needed natural oils, nor will it cause any further damage. 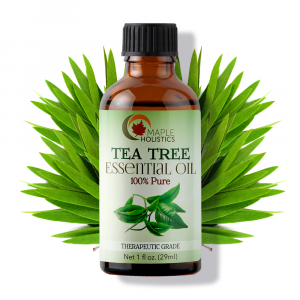 For best use, Australian Tea Tree oil can be mixed and used in conjunction with other oils. Some of the other most popular essential oils include lemongrass, jojoba, peppermint, argan, evening primrose, and lavender essential oil. Take your mixture and apply it directly to your pimples. Just a tiny dab will be potent enough to penetrate and disinfect the pores. It can also unblock sebaceous glands; and dry out pimples, blemishes, whiteheads, blackheads, and other imperfections. To get the best results, leave the oil on overnight, or a minimum of several hours. Some people use the Tea Tree oil in a face mask instead. Rather than applying it directly as a spot treatment to the pimples, a few drops of the oil can be mixed with green clay powder and water. Leave the mask on for 10-20 minutes to reap all the benefits. You can use Tea Tree oil as a natural hand sanitizer. It has the capability to kill germs that are responsible for illnesses like the cold and flu. It also can act as an insect repellent. According to research, cows that were treated with the oil had sixty-one percent fewer flies bothering them than the cows that weren’t. You can even add the oil to your child’s hair detangler to prevent them from catching lice. As I mentioned earlier, you can use Tea Tree oil for oil pulling which means you can also use it as a mouthwash. Research suggests that it may be able to fight germs that could lead to gingivitis, bad breath, and tooth decay. When you get a cut or scrape, you instantly become susceptible to infection. Tea Tree oil can be used to treat and disinfect minor abrasions and cuts. It may also e able to speed up wound healing since it can reduce inflammation and increase white blood cell activity. There are medications to treat nail fungus, but Tea Tree oil may be just as effective in getting rid of nail fungus. You can use it on its own or in combination with other natural remedies. This product serves double-duty. Tea Tree oil for hair is just as effective as using the oil for the face. Since the oil is moisturizing without leaving behind a greasy residue, it’s the perfect solution for keeping the hair and scalp refreshed. Applying just a dab to your roots and tresses will strengthen hair and help it grow while bringing back color and shine. Following it up with a Tea Tree oil conditioner can be a lifesaver for dry/damaged hair. In the few months between discovering Tea Tree oil right before my friend’s bridal shower, till the time I was a bridesmaid at her wedding, my face (and hair!) underwent a total transformation. I’d been dreading the thought of all those cameras on her big day. But my newly smooth, matte, pimple-free complexion required only the lightest touch of concealer. It didn’t need the layers upon layers of makeup that I wanted to wear in the past to camouflage my bad skin. All my friends wanted to know who did my makeup and managed to get my skin so shine-free, and now that the secret’s out – shout it from the rooftops! Tea Tree oil works wonders. As you can see from all that was mentioned above, tea tree oil is helpful and beneficial for a number of reasons. Overall, the use of Tea Tree oil is considered safe. There are still some things that you should be aware of before you use it. Even though you can use tea tree oil as an ingredient for mouthwash, you should never swallow it. Ingesting it could be toxic. Do not swallow it! You keep it out of the reach of children. Before using the oil for the first time, you should do a patch test. Put a drop or two on your skin and wait twenty-four hours to see if any skin irritation occurs. It’s important that you do this because some people contract contact dermatitis. Ironically, your dermatitis should be able to be treated with Tea Tree oil. It’s also best to use a diluted Tea Tree oil if you have sensitive skin and are more likely to get irritation from it. If you’re still not sold on how great this oil is, pay attention. 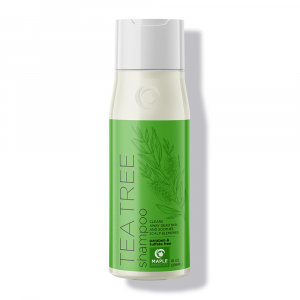 Tea tree oil serves the additional function of being a gentle and effective makeup remover. It also has natural antiseptic, antifungal, anti-inflammatory, antimicrobial, and antioxidant properties. Translation: whatever is wrong with your skin, tea tree oil can help solve the issue! Tea Tree is truly what dreams are made of.